Gary Chapman, Francis Chan, Gary L. Thomas, Alex and Stephen Kendrick, Willard F. Harley Jr. This is only a sample of the book. The book will be published and for sale in Jan 2016. God has a purpose for your marriage. Too often husbands and wives will spend their entire lifetimes focused on pleasing each other and never focused on the mission God has for them. God's Word is clear that He desires to be the single, most important being in His children's lives - even in marriage. God first. Marriage second. How are husbands and wives to carry out their God-given purpose and still find fulfillment in one another? By becoming One Flesh and seeking to serve God together. Marriages should begin on this mission from day one and the fruit of seeking God first, is a healthy functioning flesh. 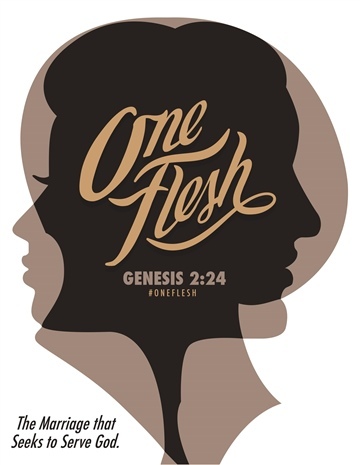 One Flesh is a bible based workbook for spouses to explore transforming from two separate entities to one flesh. Using practical applications of how body systems function, One Flesh correlates the human body with biblical truth to explain how flesh should operate. Your marriage has purpose - within God's purpose.